A New Way to Stop Alzheimer’s? Of all the major diseases, Alzheimer’s is probably the scariest. It’s the scariest because it rips away the one thing we have in this world: our mind. So I get excited when I hear of progress towards a cure. More on that in a bit. But first a little background on the mystery of Alzheimer’s disease. Sadly, we still don’t know exactly what causes it. Instead Alzheimer’s is usually diagnosed by its mental symptoms: loss of memory, issues with speech, and other cognitive impairments. These symptoms manifest gradually. Because of this, Alzheimer’s can sneak up on people. One way to prevent this sneak attack is to test for amyloid-beta plaque building up on the brain. Scientists speculate that the plaque impairs brain function by shutting down neural connectivity. The plaque, it appears, is linked to high levels of inflammation in the body. In addition to plaque, Alzheimer’s brains also have tangles. 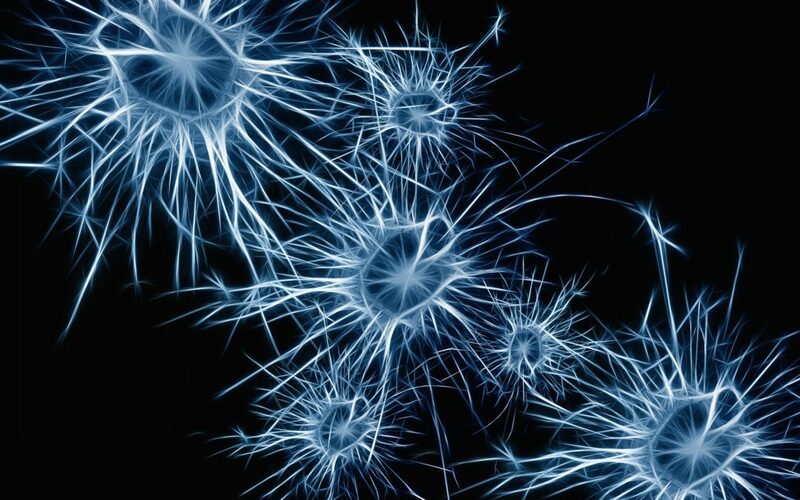 These tangles, called neurofibrillary tangles, are thought to hamper neural connectivity and cause neuronal cell death. The tangles are made of molecules called Tao proteins, which are also linked to high levels of inflammation in the body. So again, inflammation plays a role. So plaque, tangles, inflammation, and even neurotransmitter dysfunction have been implicated in the pathology of Alzheimer’s disease. Okay, so I haven’t done justice to these theories. Nor have I listed all the theories. That’s because I want to get to that progress I was talking about earlier. To refresh your memory, mitochondria are organelles within our cells that produce energy. When our mitochondria aren’t healthy, neither are we. There’s evidence, in fact, that mitochondrial damage contributes to neuroinflammation typical of Alzheimer’s. Given this evidence, the Swiss researchers guessed that activating “clean up” pathways in the mitochondria would improve Alzheimer’s symptoms. To activate these pathways (known as UPRmt and mitophagy), the researchers used doxycycline (an antibiotic) and nicotinamide riboside (a form of vitamin B3). The protocol was tested on worms, cultured human neurons, and mice. The results? Worms given this protocol lived longer and had less amyloid plaque. Ditto for the human brain cells. But the mice showed the best result of all. Not only did treated mice have less plaque, they also showed significant improvements in cognitive function. Which made the scientists happy. By now you’re probably wondering how to improve your mitochondrial health and potentially get these benefits. Let’s look at some possibilities. Nicotinamide riboside – the vitamin used in the Swiss study – is one option, but it’s also expensive and relatively unproven in long term human trials. To my knowledge, the best proof of its safety was financed by a company called Elysium. Elysium sells nicotinamide riboside. Hmm. The other compound from the study, doxycycline, has some unfortunate side effects. Like making you fat and wiping out your microbiome. So yeah, I can’t recommend that one either. 1. Fast. Fasting turns on mitophagy, one of the mitochondrial “clean up” mechanisms activated in the Swiss study. Personally, I do a 13-14 hour fast daily and a 16-20 hour fast about once a week. (Longer fasts can have a larger effect, but they can also be excruciating). 2. Get hot. Get cold. Heat therapy (sauna, steam room, etc.) and cold thermogenesis (cold shower, ice bath, etc.) signal your body to produce heat shock proteins (HSPs). These HSPs then proceed to circulate, neutralize free radicals, and clean up your mitochondria. For this and many other reasons, I get hot and cold just about every day. 3. Sprint. Mitochondrial function declines with age. Bummer. Yet just 12 weeks of high intensity interval training (4 bike intervals 3 times a week) reversed this pattern in older adults. For my sprint regimen, I follow Mark Sissons’ guideline: one hard session every 7 to 10 days. To be clear, I’m not putting this out as a treatment program for Alzheimer’s. These are just a few strategies for improving mitochondrial health, which may in turn reduce the risk of neural degeneration. For a more detailed discussion of Alzheimer’s prevention (supplements, biohacks, etc. ), check out this excellent podcast from biohacker and health coach Ben Greenfield. As of today, Alzheimer’s remains a disease without a cure. But with so many smart people working on the problem, that could change soon. Maybe in 50 years, it won’t be scary at all. Because maybe in 50 years, Alzheimer’s won’t exist. Brian Stanton is a freelancer and health coach living outside of Philadelphia. When he isn't writing, Brian is either hiking in the woods, practicing yoga in the morning frost, or blending together dozens of fruits, veggies, and powders in his super-charged blender. Brian writes on nutrition and meditation at primalsapien.com.